This is a beautiful song. Thanks for sharing it. New to me. Also new to me. :) Thanks for sharing. Love that song!! ..."And He came that we might have life.......and we do not stand alone." Happy Saturday to you. 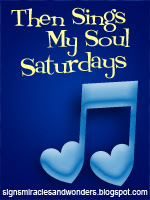 Beautiful song for Then Sings My Soul Saturday. Very nice song. I have never heard it before. Thank you for sharing with us today. Lots of new to me songs today. I was raised as a methodist, last year my daughter decided at 20 she wanted to become catholic. She loves it, and it has opened her whole life to God in ways I couldn't imagine. Oh, Mary! This is a beautiful song, isn't it. I love this song. Thanks for visiting my blog! another new song for me :) nice one!